OLED displays are desirable thanks to their deep blacks, excellent contrast, and the enabling of extremely thin and light and even flexible designs. However there are several known drawbacks too; production yields impact on cost, blue pixel life is said to be shorter, and there seems to be a greater potential for burn-in issues. It is that last issue that has been highlighted in recent months by reports of screen issues from owners of the Google Pixel 2 phones, and much more recently by observations of an LG OLED 65-inch TV on show at the SID Display Week 2018 in Los Angeles. 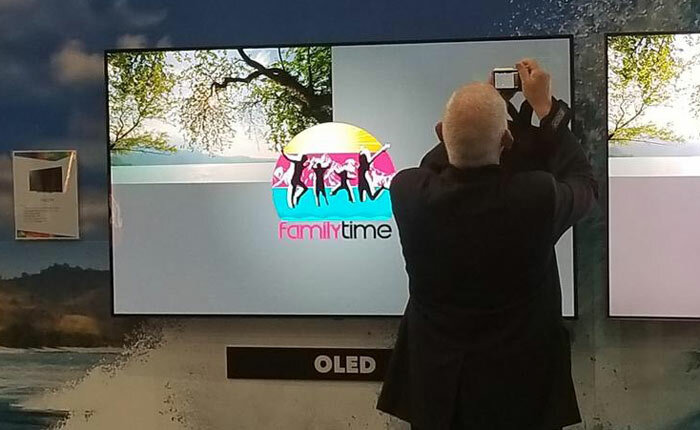 ZDNet's Cho Mu-Hyun reports that quantum dot developer Nanosys was showing off an LG OLED TV and a Samsung Electronics QLED TV at its booth at SID 2018. Nanosys has reportedly bought the LG OLED TV (a 2017 revision) from a store only two of three weeks ahead of SID 2018. At the three day show signs of burn-in were seen on the first day "according to multiple eye witnesses". The TV was only turned on for 8 hours a day, coinciding with the opening and closing of the show. Ahead of the show the TV had been used for 50 or 60 hours it is reported - but we don't know what was on screen during that period. 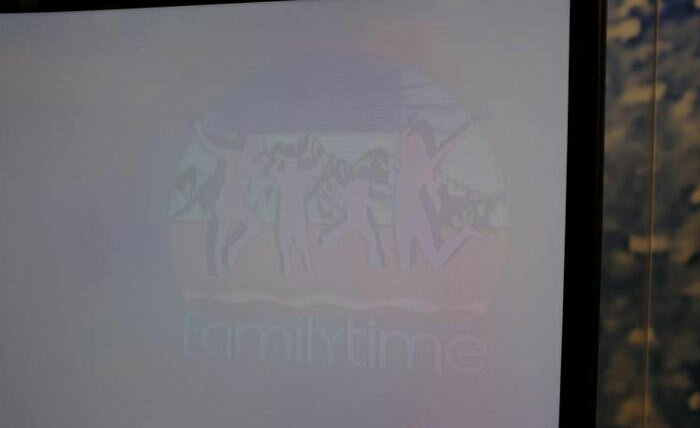 You can clearly see above that the 'family time' logo is burned into the display. This logo is part of the video image quality demo loop run by Nanosys at its booth. Apparently, LG representatives at SID 2018 visited the Nanosys booth multiple times during the show, after hearing about the display issue. In reaction to previous consumer reports, LG has asserted that burn-in should not affect picture quality during 10 years of an average TV which is on for 8 hours a day (~30,000 hours). However, LG has previously admitted a factory problem affected some panels were more prone to burn-in than others. Just a couple of months ago LG monitors at South Korea's Incheon International Airport suffered from noticeable signs of burn-in after three months of deployment and were subsequently replaced with LCD models for viewing clarity. Presumably monitors at exhibitions (and for public display) will be operated at higher brightness levels than in a domestic environment. Domestically TV tends to me frequently changing images which also mitigates against burn in. This CNET article goes into burn in (or image retention) in some detail, including how to mitigate it in the first place, or remove it if it does occur. That said, the critical bit is that (they assert) it is due to uneven ageing - which re-inforces the fact that at present OLED displays may have a shorter life span than ‘conventional’ display technology. Personally I would expect to see burn in on any OLED or Plasma panel if it was displaying a static image for 8 hours a day. You'd be a fool to think otherwise. Now the real question is was it displaying a static image. Both my Panny plasma's have burnt in Sky logos in the bottom left corners from where the family has paused a program and then left it for a couple of hours or more, repeatedly. :( OLED I would not expect to be any different in this regard and fully expect to get burn in. Goes with the territory I'm afraid. Yeah so OLEDs don't burn in, the pixels continue to degrade after a certain amount of usage. If the ‘blue’ subpixel is used loads for a logo, it will degrade quicker than the surrounding blue subpixels and look like there is ‘burn in’. For everyone to see it is really still ‘burn in’ but it is caused by different things. It happens to every OLED from every company. Having read this, I'm pleased I went for a FALD LED Bravia instead. My sons are terrible for leaving Sky paused for ages while they have dinner or go out in the garden. There is plenty of evidence that burn-in does occur on OLED displays, not least the image in the article. Burn-in simply refers to a persistent after-image, not literally burnt in to the screen.